Happy Wednesday! Hope you are well and readjusted to the lost hour this week. It’s really hit me and makes today feel like it took forever to get here! But on the bright side of things, it’s nice that the weather is starting to show us signs of the spring to come. There’s something about spring that rejuvenates me. I feel lighter on my feet, happy to feel the sun more and go out to explore beautiful places, and wear lighter colors! Our family recently took a weekend trip to Philadelphia, and outside of New York City, it is one of my favorite cities to visit! There’s something old, classic and vibrant about Philadelphia that we enjoy. I was excited to do a shoot by the Franklin Institute, where the architecture of massive columns and aged stairs made for the perfect backdrop to my outfit. If you’d love to learn more about their current Science of Pixar exhibit and all things currently happening there, sign up for my newslett (right here!) where I’ll be sharing an exclusive inside look at what we experienced! We were so excited to be one of the first people to experience it all! As for fashion, I’m starting to enjoy the architecture and structure of clothing more than before. I think I always have, but now I pay much more attention to the finer details. And it’s fascinating when you do, because you start to truly discover what works for you and makes you feel good when you get dressed. Structured blazers, classic lines and architectural shapes have become a new favorite way for me to explore my choices when looking to share looks with you. I’m currently loving this white blazer so much! It comes in other colors at LOFT and I might just get them all! And if you’re in the local NJ/NYC area on April 1s,t I’d love for you to join me at my first Style Event with LOFT! You can RSVP here! Feel free to bring your gal pals along! Hope you enjoy! Thank you so much for stopping by and reading! Wishing you a beautiful day! Stay golden! Is it totally bad of me to be IN LOVE with this look!! You have me swooning on this one girl!! What a gorgeous look! Those sandals and a stripe top are must-have for spring and summer! I love the blazer, but the jeans look great on you, too! Where are they from? Love those jeans with the blazer! It’s the perfect springtime outfit! 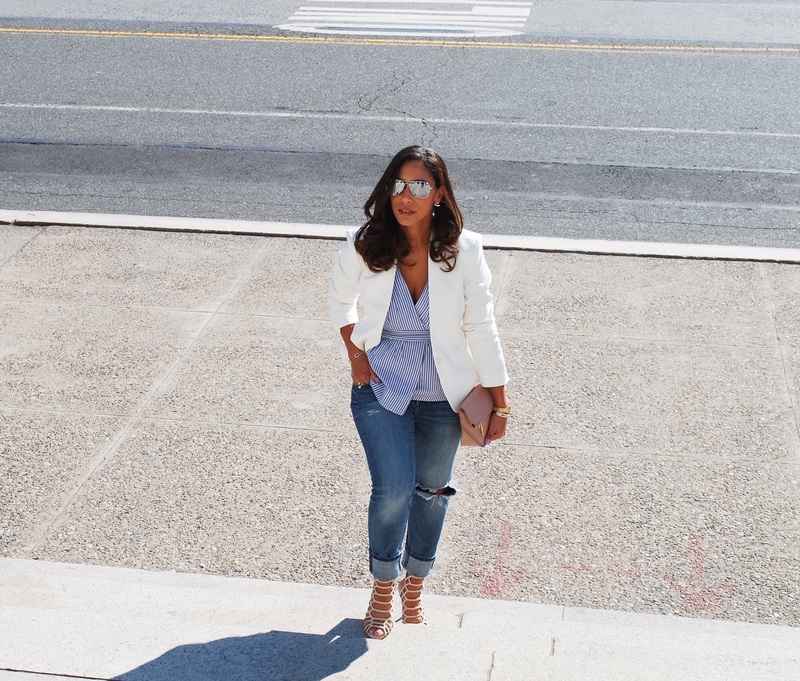 Such a cute outfit, I think that a white blazer is a must for Spring. I love all of these photos you look beautiful! I love love love this whole ensemble! You are so beautiful. Those sandals are gorgeous I just might have to buy me a pair! This is such a cute outfit – I love that top on you!